Do you think health and kid-friendly promotions go hand in hand? If you are yet to believe in this magic, you should see these customized jump ropes to confirm your doubts. 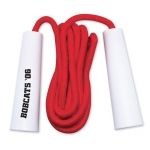 These custom printed skipping ropes will add some retro fun to your promotions and they will inspire kids as well as their parents to think seriously about fitness and health. As you already know that there are testing financial times ahead. It is quite obvious that people cannot afford to take expensive gym memberships to stay fit. However, they can all try a few minutes of exercise with a jump rope to tone their muscles and maintain good health. So if you are gearing towards fitness or health friendly promotions, these promotional jump ropes are the best. Not only kids but their parents will be forced to take note of your branding efforts. They will be inspired to work out daily. 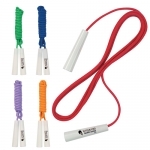 Logo jump ropes are ideal to promote gyms, fitness clubs, sports club and health services providers. 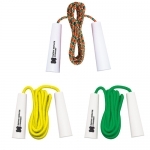 These skipping ropes are perfect items for fundraisers and for sports sponsorships by schools, charitable trusts, college sports teams and as business gifts. Select from our vast range of woven jump ropes with contrast handles in various colors for your next campaign. As you might have noticed every other vendor at the trade show is offering promotional swag that keeps users seated at the desk such as notepads, coffee mugs, pens and pencils. Why don't you try to stand out by giving gifts that will keep your recipients healthy and happy? Why don't you try to give out something that their kids will enjoy? Then probably the only item that fits into this bill is promotional jump rope. 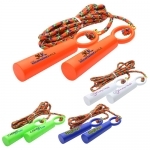 Like all other promotional giveaways for kids offered at Promo4kids.com, these logo printed jumping ropes are guaranteed to arrive on the time before your scheduled deadline and at the least possible prices than ever. Order yours today at guaranteed low prices! 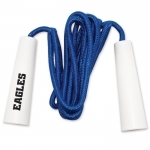 If you have any doubts about promotional benefits of these skipping ropes, favorable imprint options over them or price benefits, our promotional product experts will readily help you. They are available at 855-454-3786 from Monday through Friday (8 AM - 6 PM EST). If time permits you can send a detailed email to info@promo4kids.com.